A range of items can be tagged and tracked, such as a car or laptop. According to Rodney Bohach, inventory control was a mess when he began his new job as the property and distribution services coordinator at Hillsborough Community College (HCC) in September 2011. That made it difficult for the five-campus, 28,000-student college, located in Hillsborough County, Florida, to efficiently and accurately file required inventory reports. Like all U.S. public institutions, HCC must meet state regulations on asset audits. All items purchased by public institutions in Florida whose value exceeds $1,000, for example, must be accounted for in annual reports. This includes not just when such items are placed in service, but also when they are discarded or donated at the end of their useful life at the institution. Items purchased with federal grant money must also be tallied in separate reports. The job at HCC is especially challenging given its multiple locations, each with five major departments, for a total of 25 departments. Assets tracked at HCC include vehicles, network switches, audio-visual equipment, computers, microscopes, and other laboratory devices and food-service equipment—a total of $324 million in active assets. Inactive assets—that is, those that are no longer in service at HCC—must also be tallied to account for depreciation. 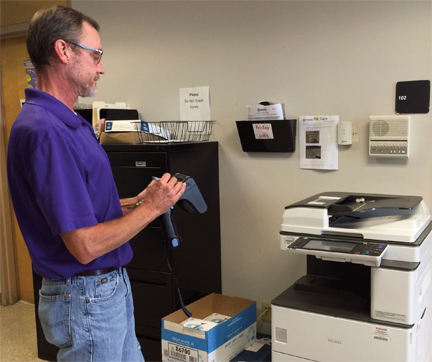 Rodney Bohach scans tags and validates read data. In 2009, HCC worked with Silent Partner Technologies (SPT) to implement an RFID asset management solution, which features its IntelliView software application. SPT spent several months going through each department to identify inventory and tag every asset beyond the $1,000 threshold. “Properly identifying and categorizing each and every asset was a challenge, to say the least”, says Ted Kostis, SPT’s CEO. Since HCC staff members were not involved with this process, proper tagging procedures were never implemented. Bohach found that the students who had been put in charge of tagging the college’s assets had gone “ bananas,” tagging some assets multiple times. “They were tagging, double tagging and adding assets that had already been tagged,” he says. In addition, four or more different names and descriptions for the same item would sometimes appear in the database, making tracking them more difficult. 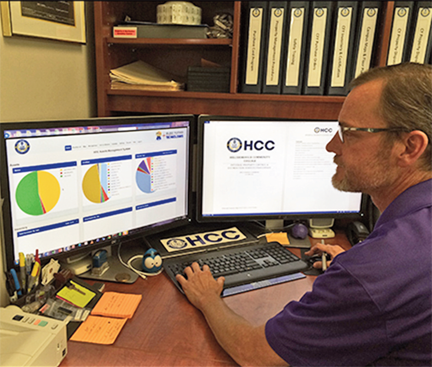 Fresh from a 24-year stint in the U.S. Air Force, managing the comings and goings of tools used for aircraft maintenance, Bohach began a new mission: getting HCC’s inventory in shape. “It’s been several years of me trying to clean this up,” Bohach says. He and his team of three property assistants implemented new procedures and upgraded some of the RFID technology. The improvements resulted in significant benefits, he reports, including fewer person hours spent inventorying the 16,900 items, clear oversight over the college’s assets, and a clear path to future enhancements. Rodney Bohach updates the IntelliView database. One of the first things Bohach did when he began his new job was to move his office from his predecessor’s offsite location into HCC’s warehouse, where he can directly oversee the processing of incoming assets and those being taken out of commission—which, he says, occur in almost equal measure. “Now, I see everything that goes on,” Bohach states. The life of a tracked asset begins with a purchase order from an HCC employee. A professor, for example, might order 60 microscopes for her classes. The ordering process for any items worth more than $1,000 automatically goes through Bohach. (Items valued at below that amount don’t need to be tracked.) To RFID tag and register items, Bohach brings a paper form to the loading dock, along with as many tags as he needs. The assets are tagged as soon as they are unloaded from trucks, sometimes before being removed from their boxes. Currently, HCC uses Confidex Steelwave Micro ultrahigh-frequency tags, though Bohach plans to switch to Confidex’s Silverline tags for future purchases. Bohach attaches the tags sequentially and records the serial number of each tagged item on the form. He also notes the item’s name and model description, as defined by the manufacturer. (He anticipates being able to enter this information on a tablet in the near future, once Wi-Fi connectivity problems at the warehouse are resolved.) Back at his desk, Bohach then enters the tag numbers, descriptions and serial numbers in the IntelliView database. Finally, the tagged items go out for delivery on the 20-foot box truck run by Bohach’s team, and the items’ purchaser signs for them. The driver then brings the signed forms back to Bohach, who scans them into the IntelliView database using a Canon imageFORMULA DR-M140 Document Scanner. Inactive items are returned to the warehouse, where Bohach and his team employ CSL101 UHF handhelds provided by Convergence Systems Ltd., from the initial deployment, to read the tags. For audit purposes, the major consideration is to be able to accurately identify which items are being retired. 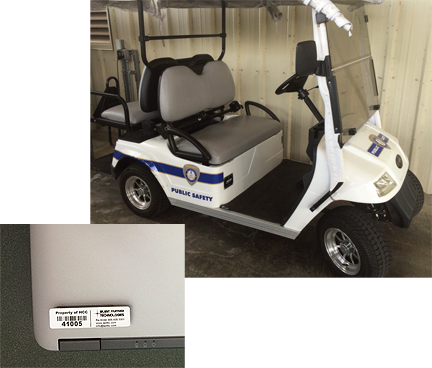 These items are stored at the warehouse for six to 12 months, awaiting approval from HCC’s board of trustees. Upon their release, the items are donated to local charities or sold to scrap dealers. In addition, Bohach and his team use the handhelds to correct items still in service that have been improperly identified in the database—though this type of error has become less common since he took over, Bohach reports. Finally, they use the handhelds to reassign items to new users and to register new locations for them. Bohach has established a close working relationship with Kostis. The two worked together to update the IntelliView software, which runs on cloud-based servers leased by SPT. To update the locations of multiple items, for example, SPT added a bulk location update feature. Bohach appreciates the software’s quick access to the information he needs. “I have visuals,” he explains. “I can open my homepage and I have a visual right there in front of me…. I can look at it and say, ‘Okay, nothing looks odd today,’ whereas before, I didn’t see anything.” To find mislabeled items early on, he would have to download the data from IntelliView into a spreadsheet and apply filters to find what might be amiss. Now, a mistyped entry made during the intake process shows up on the homepage on a chart summarizing the latest entries.